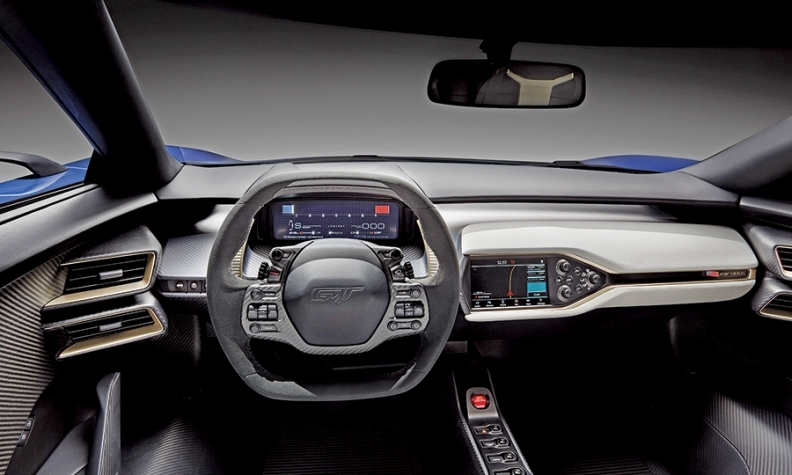 The Ford GT has a stalkless steering column; controls are on the steering wheel instead. DETROIT -- The Ford GT's dramatic exterior styling has grabbed attention, but as Ford global design chief Moray Callum points out, some cool stuff is happening inside the car, too. Callum, speaking last week at the WardsAuto Interiors Conference here, revealed that the GT has a stalkless steering column -- meaning no turn signal, light switch or windshield wiper levers. Those controls and others are on the steering wheel, Formula One race-car style. "Really getting the steering wheel right was integral to getting the [interior] design right," Callum said. "All the controls are really close to where you need them as a driver." Though he declined to say what level of connectivity the GT will have, he said the car will have a screen in the dash but that electronic technology would not distract the driver. Callum said the steering wheel is one of the most important components of the car's interior. Drivers, he said, will be able to operate the car at 186 mph comfortably. Ford plans to start production of the carbon-fiber V-6 turbo supercar late next year.